Last updated 01 August 2018 . By Faith Strickland. 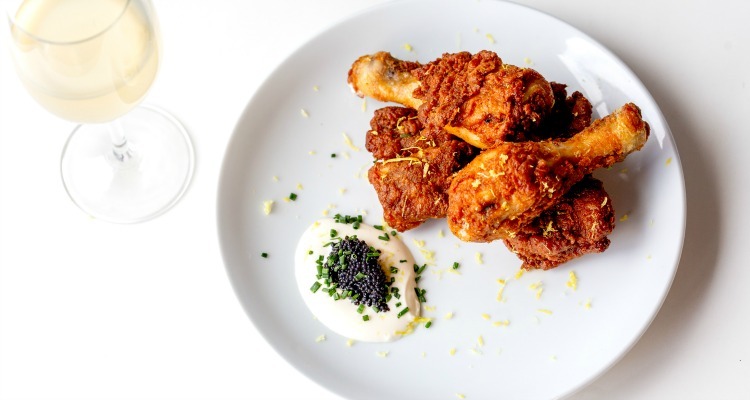 Carte Blanche is fusing American and French flavours together with dishes such as fried chicken and caviar. From supporting The Who on tour to teaming up with Kelis for a pop-up menu, Le Bun co-founder Andy Taylor is cool. And he’s not losing any points with his latest venture, Carte Blanche, which has just opened on the rapidly developing Mare Street. An intimate spot not far from London Fields, the new restaurant is stripped back and simple; wooden stools line a white bar, and the back half houses a tiny eating space and open kitchen. As with Le Bun, Carte Blanche fuses American and French flavours in beautiful matrimony, though this time, the menu is a smarter take. There’s still the fan favourite burgers, but they play second fiddle to a list of upmarket ingredients and dishes. Oysters (£3.5 per oyster) are battered and deep fried, coming with a hollandaise-style sauce which we slurp noisily from the shells, and the tangy buffalo chicken wings (£6) peeled easily off the bone. The short rib (£22) was a show-off, stand-out piece of cooking, as the slow-cooked meat, wobbly with layers of melting fat, sliced easily under our knife. Ox cheek mac & cheese (£7) didn’t have the same wow-factor, with the cheese sauce unset and slipping off the pasta. From orange wine to chilled red, the drinks list is full of interesting bottles, along with classic and easy cocktails - the French Negroni is a perfect antidote to all that rich food. Carte Blanche is open on 175 Mare Street, London, E8 3RG, Wednesday - Sunday.